Bubbles – Borax or Bicarb? There are many products available to the glass worker that produce bubbles when used between layers of glass. Some have a specific COE, some are coloured, all seem to be rather expensive. And then there are other products that have no COE and are not coloured. What’s going on? In this blog I will explore two products that you may already have in your home. Both can be used to deliberately create bubbles between layers of fused glass and neither of them are as expensive as “proprietary” products you may have seen advertised. One is called bicarbonate of soda and is used in cookery. The other is a household cleaner and is called borax. Neither is expensive. Incidentally, you may have already noticed a blog I made earlier today that relates to borax – it’s useful stuff! In this fuzzy first picture you will see two rectangles of glass onto which I have placed a small S (for bicarbonate of soda) and a small B (for borax). You will also see that I have sprinkled some of each product onto those rectangles of glass. I used only a tiny amount of bicarbonate of soda (which was a very fine powder) but used rather more of the borax (which was a coarser powder). 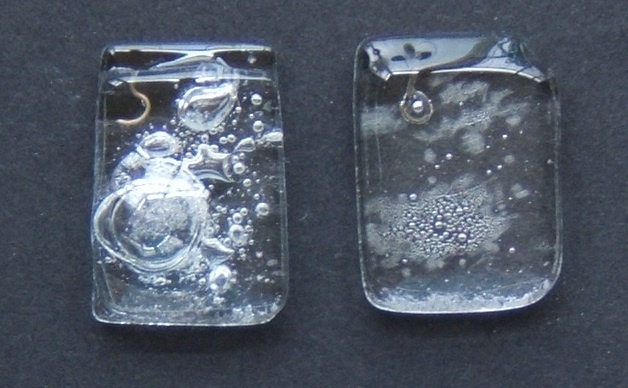 After firing in a microwave kiln these experiments produced rather interesting results. You can clearly see what happened in the second picture. 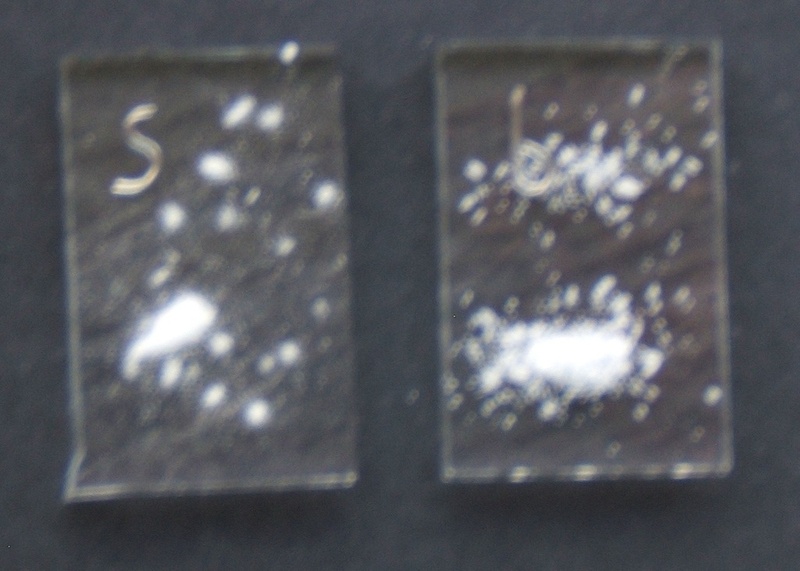 Notice that the bicarbonate of soda (on the left) has produced big bubbles, despite being used very sparingly. If you look back at the first picture you will see that I used only a tiny sprinkling except for the lower left where you now see a massive bubble. This is powerful stuff! Notice also that the borax (on the right) has produced fewer and smaller bubbles, despite being used more liberally. If you look back at the first picture you will see that even a liberal dose of borax near the bottom produced only a cluster of small bubbles. Thinking about what’s happening to these two household chemicals leads me to suspect that the borax (which is Sodium Borate Decahydrate) boils away most of its vast amounts of water of hydration rather too quickly to create bubbles, leaving little to produce bubbles at higher temperatures. By contrast I suspect that it is the breakdown of bicarbonate of soda (which is Sodium Hydrogen Carbonate) at higher temperatures to produce carbon dioxide gas, rather than its liberation of water vapour at lower temperatures, which ensures bigger and better bubbles. So, from the perspective of glass fusing you have two choices and they behave differently. Bicarbonate of soda gives you lots of bigger bubbles. Borax gives you fewer and smaller bubbles. It’s good to have a choice – one for the spectacular effects and one that allows for finer control of bubble formation. Over to you. Your turn to experiment and tell me what you have discovered. This entry was posted in Borax, Bubbles, Experiment, Microwave kiln, Money-saving ideas and tagged Borax, Bubbles, Experiment, Microwave kiln, Money-saving ideas. Bookmark the permalink.